Speaking to groups is easy for me. Sure, I feel like a caged animal before I get started, but once we get rolling, it’s exciting. Judge people by their strengths, not yours. People feel misunderstood when you make light of something they struggle to do. It’s arrogant and disrespectful to say, “It’s no big deal,” when it is a big deal. Remember and respect strengths. Mary is great at organization, follow through, compassion, and one-on-one relationships. If I judge her by her passion for public speaking, she falls short. If I judge her by her strengths, she’s fantastic. Don’t feel superior because you have strengths others don’t have. Stretch people – don’t break them. 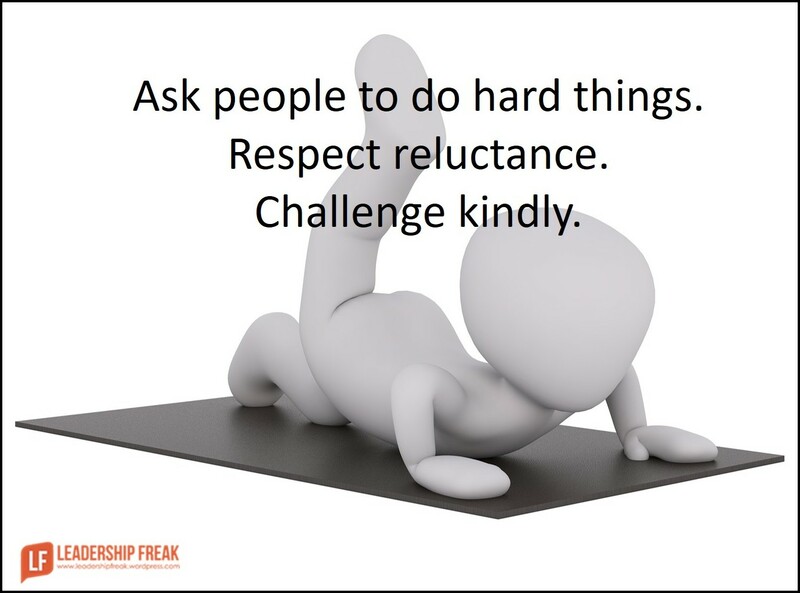 Ask people to do hard things. A few times a year I ask Mary to say something in public. People respond well to her. I only ask when she’s the best person for the job. It helps that we respect each other. Wait a moment and ask again. Honor their “Yes”. Respect their “No”. What happens when leaders use their strengths to judge others? 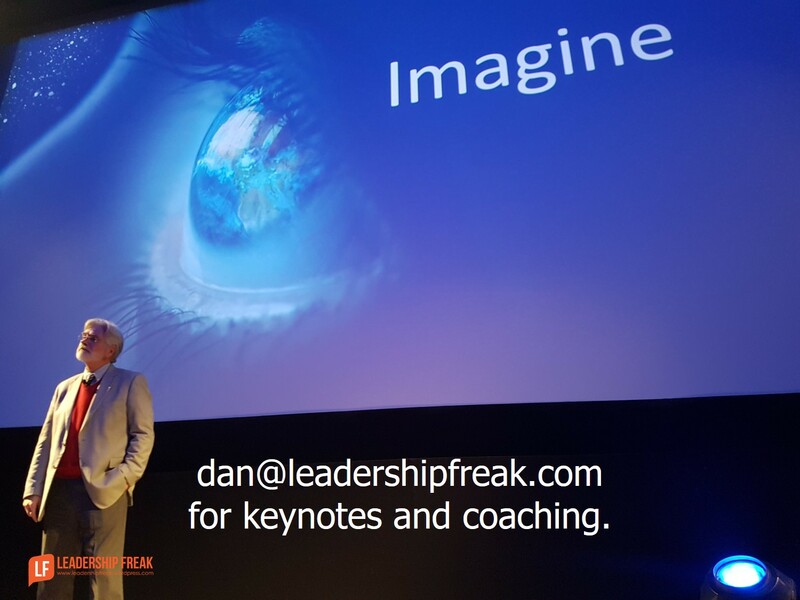 How might leaders stretch people? **Don’t miss the followup to this post: Arrogance and Other Concerns with Stretching People. This is AMAZING!!! Honor their Yes, Respect their No! Respect the pain. Whew….you sure are good at serving up breakfast Dan!! Lesson for me is don’t feel superior because you have strengths others don’t. Meeting people where they are and accepting that is important. However, everyone has something to offer, leaders should concentrate on that and bringing those strengths to the forefront. No one has to lose for you to win!!! Thanks Yanelle. It’s so easy to feel superior when we focus on our strengths and the weaknesses of others. When we’re on the receiving end of this judgement it’s very demeaning. I’ve actually forgotten the great contributions of people because I judged them through the eyes of my strength and their weakness. What a great loss for them, me, and the organization! Excellent. Yes indeed. Beware self-referencing. I cannot impose my strengths and weaknesses on others. What comes easy or hard for me, will likely be quite different for others. Thanks! Thanks Pete. I find the term ‘self-referencing’ useful. We fall into the trap of preferring people who are like us. When that happens, teams become less diverse. i always love encouraging people and letting them know the why behind the what. It helps when people know that you believe in them and there is a specific reason as to WHY they are doing something. If the why is big enough and connects with them deeply, they might cling to the why more than their fear of inadequacy. Thanks Josh. Great observation. When I ask Mary to stretch herself, it connects with her values. She can speak from her heart because she cares. “Why” is fuel for “what”. No why – no fuel. Great post! I think I am guilty of judging people by my strengths, need to create strong awareness around this! Thanks for the article! Have a great weekend! Thanks Dawn. I think it’s a natural inclination to judge through the lens of our strengths. Just seeing the inclination helps. I find it’s useful to remind myself of all the good qualities a person has when I want to judge them for not being able to do what I do easily. Totally agree! Respect the NO! Do not set people up to fail. Early in my career I was assigned to proofread the company newsletter (before spellcheck). My boss thought this was a good developmental assignment because I do not spell well and I am not a good proofreader. I just DO NOT see errors. I protested to no avail. In spite of hours of work I did not do well. Then I received disciplinary action for my poor performance and was used as an example for months. That was 35 years ago..I have never forgotten. I left the company a short time later and have gone on to have an awesome career. I still can’t proofread. Isn’t it sad that something good like growth ends up being the reason someone is discouraged and frustrated. Too often I forget that what may come easily/naturally/be comfortable to me may not be so easy for other people. I think I’m getting better, but periodic reminders like this are always helpful. An important factor in this story is where Dan says Mary was the best person for the job in this case, not that he deemed it important for Mary to be more comfortable with public speaking. Like a coach, playing people to their strengths has become my management mantra. If you have a good goalie, don’t tell them yeah but they need to be a better midfielder. Coach them to be the best goalie they can be, assuming that’s what they want to do. I think the analogy holds at work. Mary should have a say in what skills she wants to develop. Trying to make people into something they’re not doesn’t tend to work out well. Thanks Anon… YES! The sports analogy applies. If you’re tall and thin, don’t try to be a linebacker. If your short, you may be better at gymnastics. If you’re tall, think about basketball. The leader as coach is appealing and useful. Thanks for the great reminder that we all tend to judge from our strengths and how that can negatively impact those on our teams that don’t share the same strengths. In law in the UK, failure to carry out a lawful, reasonable request (such as “Mary, could you do a talk in front of the group, please?”) can be deemed as gross misconduct and grounds for lawful dismissal, whether that person is capable, effective, comfortable or otherwise. In effect, Mary’s right to say no is totally at the discretion of the manager. You will gain very little from your superiors in this situation by “honouring the no”. Is there a way of “coaching” a common-core skillset that all staff members are required to learn/develop irrespective of their strengths/interests? I get the feeling this sort of situation falls more into the training/boot camp scenario than coaching (as I understand it). Thanks Mitch. The law in the UK seems like a consolidation of power and authority in a hierarchical environment. I’m glad you brought this up. If you can’t say no to a request, it’s a demand. I was thinking about writing a follow up to this article. Your comment has convinced me to follow through. A big part of success is hiring people with the right skill set. Pigs don’t lay eggs and you can’t get bacon from chickens. If you have a team of pigs, fall in love with bacon. http://bit.ly/1RQv5xS Granted the illustration is a bit short-sighted. But the principle is the same. Your system seems to allow managers to ask people to do something they can’t do well and then fire them if they don’t do it. We should acknowledge that if someone can’t do their job they should be retrained, reassigned or managed out. But, the problem is likely one of hiring the wrong person to begin with. Spot on Dan. It’s a problem. The expectation is that people should be able to do everything, whether it’s explicitly stated or not. I think it’s slightly different to what you said – it’s less a case of judging somebody’s strengths against your own, but more like having a fixed set of strengths everyone should have no matter what. In sciences, there’s a strong bias toward people having to have very developed “hard skills”. It’s no good getting somebody in to do a very specific technical role if they don’t have that skillset. Often though, having dedicated years to reaching the pinnacle of technical excellence, there hasn’t been much time, energy or effort left for all the soft skills. And yet, there’s an expectation that those skills are there as a free extra. What happens is that a company wants their pigs to win best in breed at the county show, then wants them to go over to the show ring and make a good fist in the obedience classes with the dogs! Hole-in-one Dan! At the risk of reiterating my colleagues above, judge from their strengths – not my own. This deeply resonates and will provide a litmus test for me moving forward. Refreshing. Thanks Chef. A good word is great to read. Thanks for jumping in. Fantastic Post today Dan. Thanks so much for your pragmatic wisdom! Thanks Jay. Have a great weekend! Make the ask, encourage, and respect the “no”. But someday a crack may appear, and they’ll do it, and the growth that results is astounding. Getting “that” monkey off their back makes them try other things that scare them, and they realize that they’re too scared of life. Seen it many times! Thanks Betty. Meaningful growth happens at the point of discomfort. Make the ask. Encourage people. Nudge with a smile. Be ready to help. But, there’s no exception to the rule that meaningful growth includes discomfort and disruptions. This is one reason that a leader who can’t ask people to do hard things is in the way. Dan, this is so good and concise I wouldn’t know what to single out that’s exceptional. But I’ll give it a shot! Leaders brimming with self-confidence can struggle to relate someone who lacks confidence in a given matter–saying speaking to a group. We all need someone in our life with a bigger vision of what we’re capable of than what we currently see. Yet, as you so clearly illustrate, having a vision for someone isn’t enough. We have to respond to their hesitation with empathy and respect. Sometimes, that’s all a person needs to feel ready to stretch themselves. Thanks Alan. Your insight regarding self-confidence applies these ideas in a whole new context. I hadn’t thought of that term. But it’s exactly right. “Mary” has come to respect my ability to see her untapped potential. Even in typing that, we have to be careful not to take a superior position. We’re all growing. Great post and great comments. Upon reading and in hindsight (that wonderful thing) I will openly admit to having compared others strengths to my own, as I am sure many others have done and more than likely still do. Through experience I came to realise not everyone has the same strengths, therefore I would look, look more for ways to encourage people to understand, as in explanations, during discussion. During the “stretch” period, work with, alongside, encourage the people that are being stretched, ensuring they do not feel isolated, possibly have, if it one person that is being stretched, have them work alongside, with someone that has been through similar. Learn from each other! Thank you for the wisdom in understanding that the reality is, As humans, We have diverse abilities and differing skill sets. To create a cookie cutter production line instead of a harmonious workplace is a recipe for disaster. Respect is best served when strong willed, hungry and driven persons with one lens can push back and recognize that they too falter, fall short, and fumble the ball. this is an eye opener for me because I judge people based on MY strengths. & that has put a dent in our relationship more often than not. So I am glad to have come across this article to put things into perspective for me. Thank you! Wow! Through this article I now realize how I offended a co-worker (who also happened to be my team leader at the time), when we were tasked to implement a new strategy at work. When she didn’t catch on as quickly as I did, I said “look it’s not that deep, I can show you”. I thought I was being helpful with this approach, but I found out through a mutual friend that she was offended. I didn’t understand, but I did seek her out later and apologized. She was curt in her acceptance of my apology, but our working and social relationship was never quite the same. Now that I’m in a leadership position, I’ll certainly be careful not to make this mistake again. I’ll definitely focus on my colleagues’ strengths and respect that they may be quite different from mine.